During a recent backpacking trip in the Weminuche Wilderness, the wonders of nature never ceased to amaze. Bend after bend nature surprised us with her smallest of marvels to her largest of wonders, from beautiful mountain views, to roaring rivers and hushing aspen to curious wildlife, the area abounded with natural curiosities. In one of the most pristine wildernesses I have experienced yet, after hiking approximately 9 miles, the trail took a gentle turn and suddenly, no more that 50 feet before me was a marvelously large creature walking the trail away from me. A moose! I silently declared to myself as I stumbled to grab my camera which was in my pack at the time. Seconds pass before I decided to fore-go the camera and to instead take a photo using my phone which was in my pocket. Quietly I followed the moose who seemed completely unaware of my presence behind him, following only a couple of minutes before he finally saw me. He then left the trail into the brush to the right. My two hiking companions were behind me a little ways so I decided to wait for them and quietly make them aware there was a moose area. After only minutes the moose appeared again, this time to the right of the trail. At this point I had already retrieved my camera. 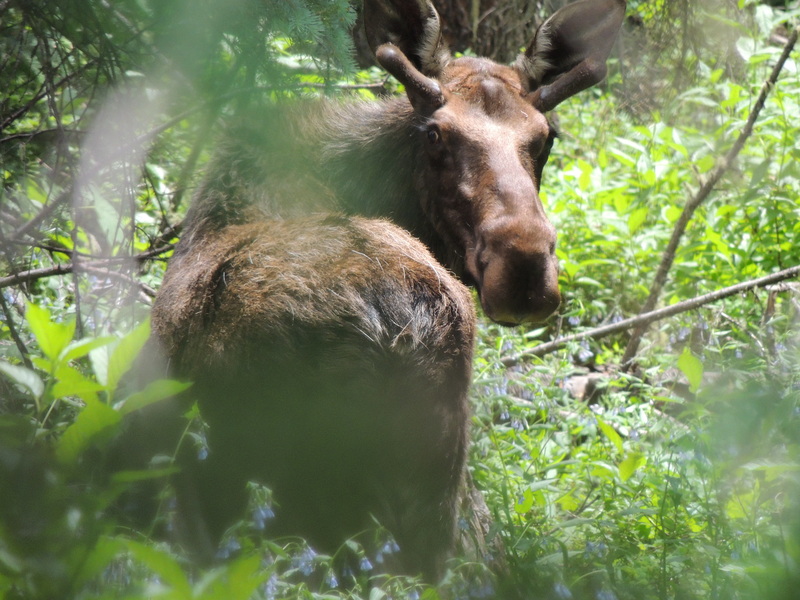 This time, completely aware of us, the moose wandered away slowly, stopping periodically to glance back at us and finally wandered away into the brush once again. The sighting left us feeling awestruck. We had expected to see deer, elk or even bear in the area, but to see a moose! was beyond a delightful. I for one felt an incredible sense of appreciation as this was not only a first for me but was also quite a rare event. But it didn’t end there. After feeling perhaps this was going to be the wildlife sighting highlight of the trip, we did not expect what was going to happen next. In the morning after, I was preparing my coffee when I heard splashing in the river near our campsite. I didn’t give it much thought, thinking perhaps another hiker might have been bathing or washing their clothes. 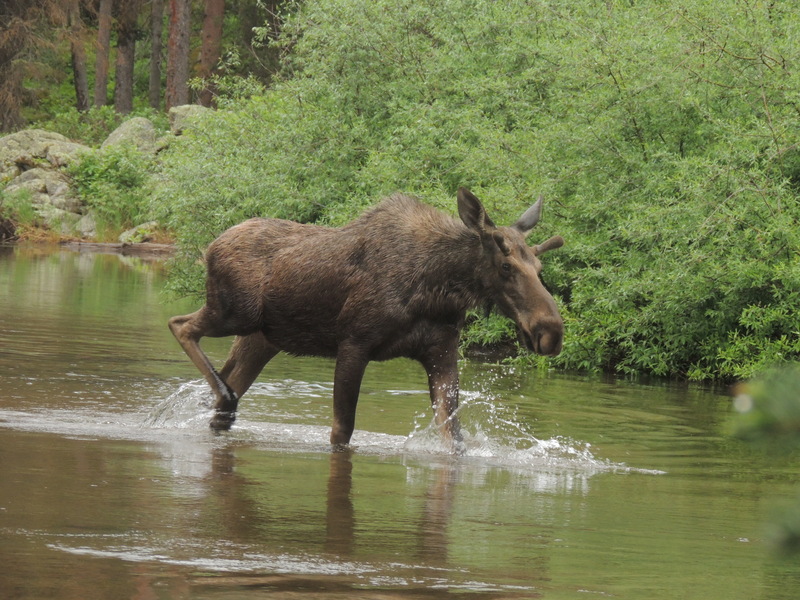 However, my friend who had also heard the splashing decided to investigate and just a moment later ran back to us to tells us that it was another moose! As we make our way to the river, we can see the moose through the trees frolicking up and down the river in a very playful manner. It was quite the sight! The moose kept an eye on us as we approached the river. After splashing around in the water 3 or 4 times he became calm and wandered slowly towards the other side. In amazement we were able to observe him for quite a while in close proximity. I couldn’t believe how close we were to this enormous creature and how his awareness of us did not seem to phase him much as he nibbled on some leaves. Once again we were left awestruck and with an even greater appreciation than before. The North American Moose consists of four different species. Each species occupies a different ecological range in the North American continent. According moose distribution ranges, this moose most likely belongs to the Shiras Moose subspecies (Alces alces sherasi syn. Alces americanus sherasi) whose range extends from southeastern British Columbia, northern Wyoming and Idaho, western Montana, parts of Utah and throughout Colorado’s Rocky Mountains. Later that day, a park trail worker had informed us that these individuals had recently moved in from the northern passes. This subspecies is the smallest species, consisting of a population of approximately 25,000. After being able to research a little more into the species, it appears that this particular group extends further south than the previously documented ranges. Perhaps this is a noteworthy observation, as changes in wildlife ranges tend be correlated with major ecological stressors. Since the 1990’s North American moose populations have endured a dramatic decline, due to unregulated hunting, global climate change and other factors. Rising temperatures also lead to greater tick and other parasitic infestations which lead to illness and premature death. 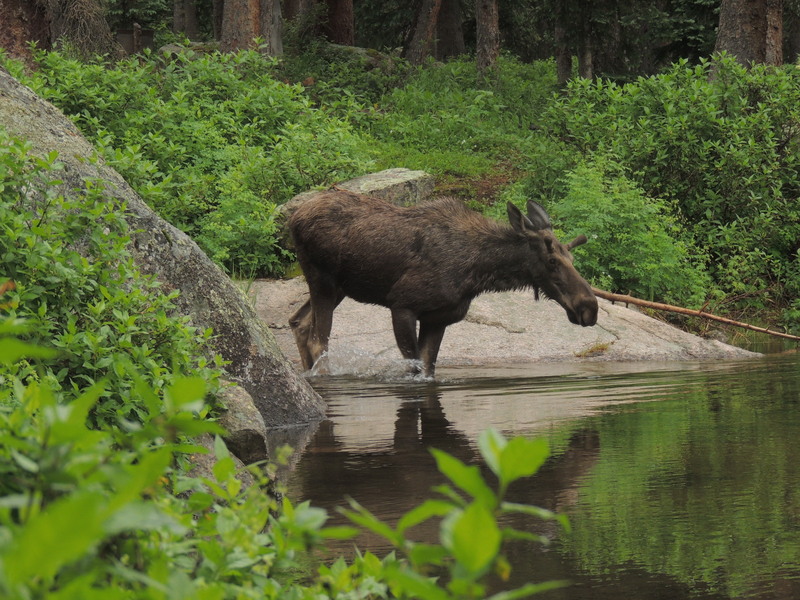 Another source states that moose were introduced into the Rio Grande National Forest near Creede and Lake City in 1992 and have since been moving south into the Weminuche Wilderness. Moose are one of North Americans last large majestic species I would hate to see us lose. However, moose remain least concerned on the IUCN Red List of threatened species. Learn more about this majestic animal here. UPDATE: Less than one week after writing this post, an article from ThinkProgress made a report of two environmental groups working towards gaining protection for Midwestern moose. If they are successful, the Midwestern moose will added to the endangered species list and will be protected under the Endangered Species Act. The Center for Biological Diversity and Honor the Earth’s petition states, moose in Minnesota have declined 60% in the past decade. Moose hunting in Minnesota was banned two years ago in hopes that the ban with help stabilize their populations. However, the greatest threat for the Midwestern moose is in fact climate change, not hunting, leading to overheating, malnutrition and parasite infestations. They are animals that thrive in cooler temperatures and are suffering the consequences directly. 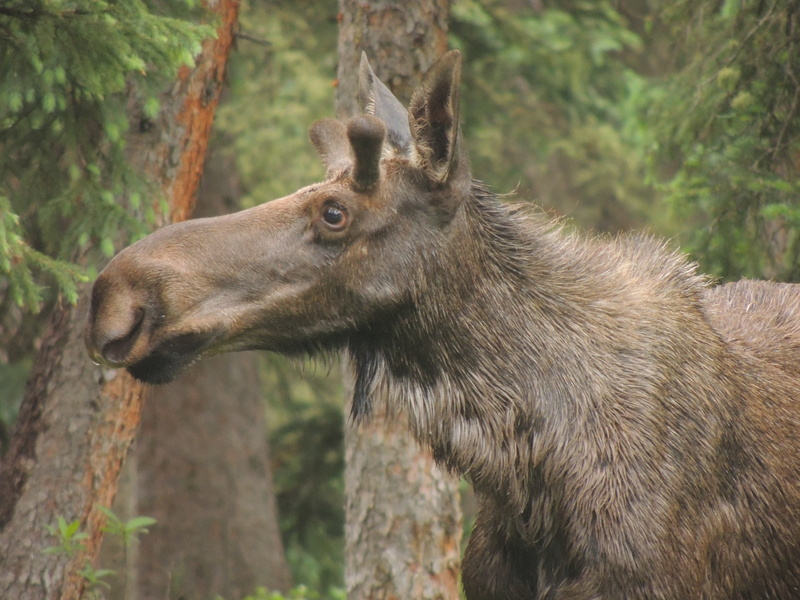 Half of moose deaths recorded in Minnesota between 2013-2014 were due to brainworms and ticks. Winters in most parts of North America or becoming shorter and shorter and the threats are becoming more and more prominent. There are many animal species that act as indicators of these threats, the moose is now one of them. We need to be paying more attention. Read the petition here.